The town of Almogía forms part of Valle del Guadalhorce. With a privileged location in the region, it became a strategic point throughout the Middle Ages for Arabs and Christians, leaving behind a mixed heritage of both cultures, such as the Huns-Xan-Biter castle and the Torre de la Vela. 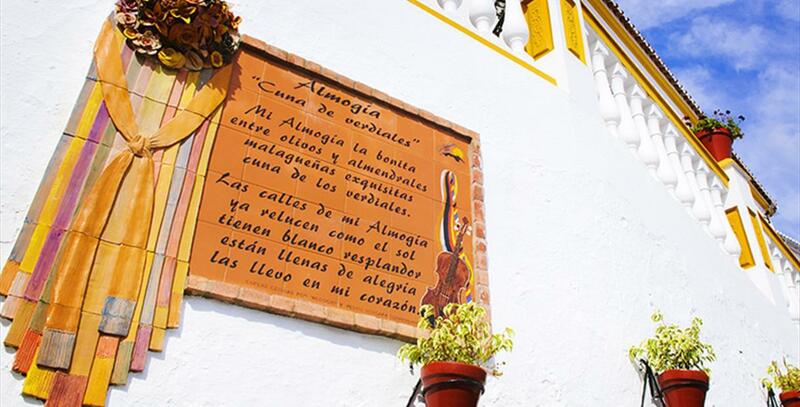 Almogía is also the birthplace of one of the most outstanding examples of folkloric and intangible heritage on the Costa del Sol: a unique verdiales flamenco singing style. 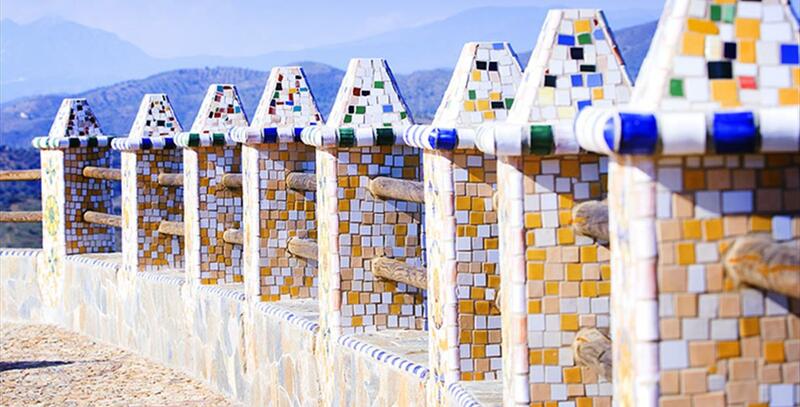 In Almogía, archaeological remains have been discovered from all the cultures that have settled here, including the Phoenicians, Romans, Visigoths and Arabs. The cave paintings at the Venta del Fraile are particularly interesting as they are proof of a prehistoric settlement in the area. The Iglesia de Nuestra Señora de la Asunción is the most attractive piece of architecture in Almogía. It was built in the 16th century and restored after an earthquake three centuries later. The Santo Cristo chapel also had to be rebuilt because of damage from the earthquake. At this chapel, you"ll have the chance to observe a beautiful painting of a crucifix. In the higher part of the town, you"ll find the remains of Almogía castle. This is the original site around which Almogía was gradually built as a local settlement, while the castle continued to serve as a point of military defence, first for the Christians and subsequently the Arabs. With the arrival of the Catholic Monarchs, the castle was destroyed, leaving behind the only part that still stands today: the Torre de la Vela. The Ermita de las Tres Cruces is located between the towns of Álora, Cártama and Almogía. This chapel is highly valued because it is where the most important verdiales festival in the region is celebrated annually. The Lavadero de la Noria is an open-air ethnographic exhibit. Here you"ll find 30 earthenware bowls with washing stones from the 19th century, demonstrating the habits and daily life of the inhabitants at that time. Almogía is only 26 kilometres from the city of Malaga, making it an ideal place to visit from the capital. If you"re travelling by car, we recommend that you take the A-7 until Puerto de la Torre. Continue on the MA-415 and then take the MA-428 until you reach Almogía. Almogía is bordered by the Sierra del Torcal and Hoya de Málaga. Between these two spots are the Santi Petri peak (794 metres) and the Retamares gorge, both unparalleled landscapes for you to explore along the hiking trails, whether on foot, bicycle or horseback. 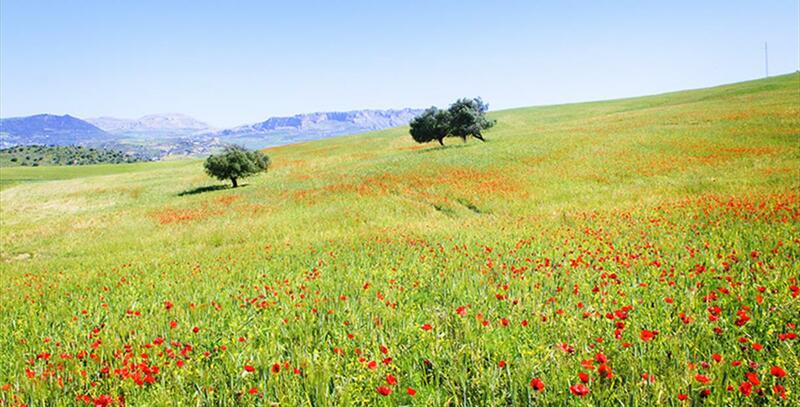 Olive and almond trees will keep you company during your wanderings in these natural areas. Almogía is home to one of the most important folklore festivals in Malaga, Fiesta de los Verdiales de las Tres Cruces. Celebrated on the first Sunday in May, this festival has received national and provincial tourism awards. Tres Cruces chapel, between Almogía, Cártama, Álora and Pizarra, is where the local pandas de verdiales get together to play music, compete against one another and dance the whole day long. As well as getting a taste of this musical style with ancestral origins, you"ll be able to try typical regional dishes. Gastronomic festivals or events related with agricultural products are common throughout the region. In the case of Almogía, Día de la Almendra (Almond Day) is held in September. Almonds have been one of the most typical nuts in the area since the Arab period. On this day, you"ll be able to try products made from almonds together with typical dishes from Almogía. During the month of August, the Fiesta de la Trilla is celebrated in remembrance of the time when crop plants were threshed to remove their seeds. The residents prepare a grand feast of gazpacho (cold tomato soup), olla (a legume, vegetable and meat stew) and pringá (the meat used to flavour the olla). Holy Week is also a great time to visit Almogía. You"ll get to experience first-hand the rivalry between two local brotherhoods that emerges at this time of year. The verdes and moraos hold their processions on different days and then on the Day of Resurrection they come together to carry the resurrected Christ. If we peek into a kitchen in Almogía, we"ll see an excellent combination of local products. Almond is one of the main ingredients in recipes such as chanfaina (an asparagus and potato dish), ajoblanco (the fantastic cold soup made with almonds and garlic) or porras blancas (similar to ajoblanco but creamier). The most delicious soup is puchero (a stew with vegetables, chickpeas and meat). As for desserts, if you have a sweet tooth, borrachuelos (spaghetti squash pasties) are sure to delight. The cave paintings found in Venta del Fraile prove that Almogía was inhabited by humans in prehistoric times. Later, it became a transit area between the coastal villages and the hinterland, as shown by the traces of a Roman road in town. Also, ruins of Roman baths and villas were unearthed at the traditional estates of Los Gálvez, Chirino and Los Moras. Little is known about Almogía in the centuries between the Romans and the Arabs. Under the latter, the village played a key role in the uprising ledby Umar ibn Hafsun against the Umayyad dynasty and their Caliphate of Córdoba. The Huns-Xan-Biter or Santi Petri Castle was a key bastion in the defence of Bobastro, as it was chosen by the Muladi leader as his headquarters. During the Reconquista, the Christian troops tore down the fortress on their way to Málaga City. After the village surrendered to the Catholic Monarchs, its inhabitants became vassals of the Kingdom of Castile. 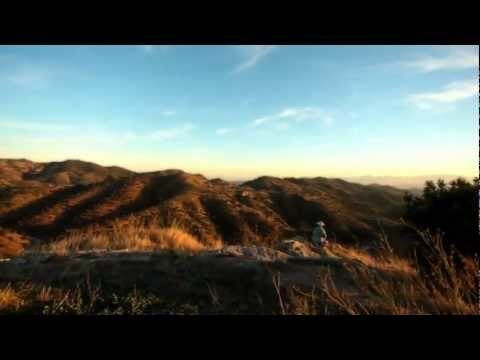 A few years later, however, they joined the Moorish rebels in the sierras of Málaga Province. Captain Francisco Sánchez de Córdoba and his 500 soldiers crushed the rioters, sending them into exile after the battle. The village was repopulated with old Christians hailing from Antequera and Teba. The Church of Nuestra Señora de la Asunción was erected in the sixteenth century, followed by the Chapel of Santo Cristo in the seventeenth century. The earthquake that shook the province in the late nineteenth century brought serious damage to both buildings, so rehabilitation work was undertaken afterwards. The village"s name, "Almogía", is of Arabic origin, but there is no agreement as to its real root or meaning. Some scholars believe it is derived from Al-mexía, the dynasty of the Mexíes. Others think the word just means "pretty" or "beautiful".